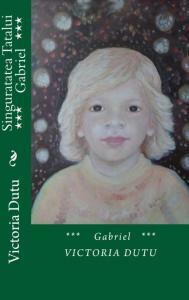 Victoria Dutu makes a comeback in the literary scene with a Romanian Edition of her Contemporary, Gabriel – Singuratatea Tatalui translated in English as Father’s Loneliness. The novel relates to love, inspired by the author’s history. Compelling, edifying and stirring – the powerful characters in the story are relatable as they conquer life’s challenges thrown at them. Dutu’s piece is a reminder that often what feels like the end of the world is really a trail to a far better place.